So, I spent the weekend in Vegas. The Virgin America jet from San Francisco to Vegas was stuffed to the rafters with techie types all buzzing about the excitement of CES, a big-deal Technological Conference. Those around me were chatting excitedly about the shows they would see, the tables they would play, and how they barely planned to see the insides of their hotel rooms. I just plugged in my headset and watched TV. I was heading to Vegas for a family wedding, and I knew there was little chance I would be seeing The Strip at all. You see, people – real, normal, ‘I have a 9 to 5 job’ people – live and work in Vegas. In fact, once you get beyond Las Vegas Boulevard (The Strip) and the few streets that run parallel, you are pretty much in the ‘burbs. 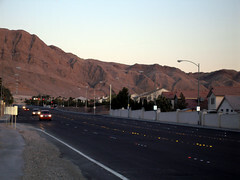 The streets in Vegas are wide, mostly 6 lanes, and there are apartment complexes, and housing communities and mini malls. So, how DID I spend my time? My cousin Mary’s daughter got married on Saturday, and she found a quirky and cool hotel to host the event. 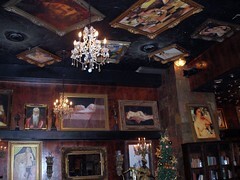 The Artisan is just off The Strip, and when we first stepped inside it took a while for our eyes to adjust to the darkness. 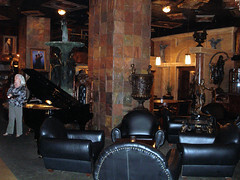 The lobby is home to a baby grand piano, a fountain, and dozens of paintings on the walls and ceiling – yes, the ceiling. 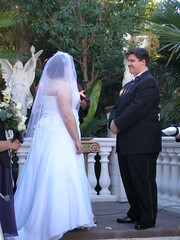 In fact, just when I started to get used to the dark interior we were ushered outside for the ceremony. Yes, outside in the middle of January – but I will come back to that later. 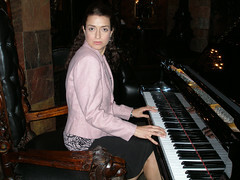 The reception was held in the hotel’s dining room, where we were served by an eastern European waitress with a thick accent and black hair to her waist. “Where did you think she is from?” my uncle asked the next day. I went with my first impression, “Transylvania.” I wasn’t kidding. And what is a wedding without cake? 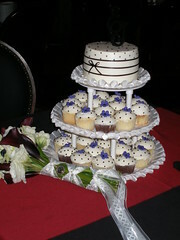 The cake, in the wedding colors of black and purple, was so good I had two cupcakes – but don’t tell the bride. We drove home at sunset, as it was an intimate lunchtime affair. As I sat in the backseat, I looked across all the dazzling lights of The Strip to the mountains beyond, and watched as the sun crawled behind them. 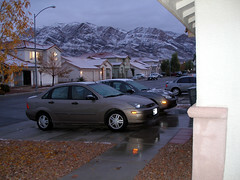 The silhouette of the mountain ridge was beautiful. 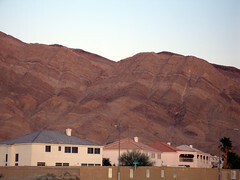 For all that Vegas in known for, it is rarely its natural beauty that gets a mention. The next afternoon, just before sunset, I went for a run down to the local park. The park is encircled by a running track, and was full of families and teens enjoying the last moments of the weekend. I ran the track five times as I watched the goings on around me. I was completely thrilled to be running outside in the middle of winter, without gloves, a hat or even a long sleeved sweatshirt. I also had the pleasure of seeing watching another sunset under a clear sky. – especially when it snows! Yes, it is possible to spend a quiet weekend in Vegas. A bit of shopping, a trip to the cinema, chilling out with family, and getting out in the fresh air…that’s Vegas, Baby! Great post Sand. SOME day I’ll get to the States!